Where is the Grand Floridian Resort located? The grand hotel Grand Floridian has an ideal location near the Magic Kingdom theme park at Walt Disney World. To reach Magic Kingdom, guests simply jump on the monorail right at the resort, or stroll to the dock and catch a shuttle boat. Other advantages of the Grand Floridian location: guests can watch the Magic Kingdom fireworks on-site, even without a room with a MK view; try the beach or dock. Also, every evening, guests can view the Electrical Water Pageant on Seven Seas Lagoon. What's special about the Grand Floridian? The Grand Floridian is the flagship property at Walt Disney World. It's also the most expensive: you can pay over $2000 for top lodgings there. Standard rooms cost much less; watch for specials, too. beautiful theming and design.The Grand Floridian is modeled on classic Victorian beach resorts; theming is carried through with vintage cars parked outside and valets in period dress. The five-story grand lobby with dome and chandelier is a sight to behold. Pools: beach pool has waterfalls and zero-depth entry; courtyard pool has a lovely setting; kiddies' pool too. pampering: top service; excellent spa; health club; fine dining at Victoria and Albert's restaurant. 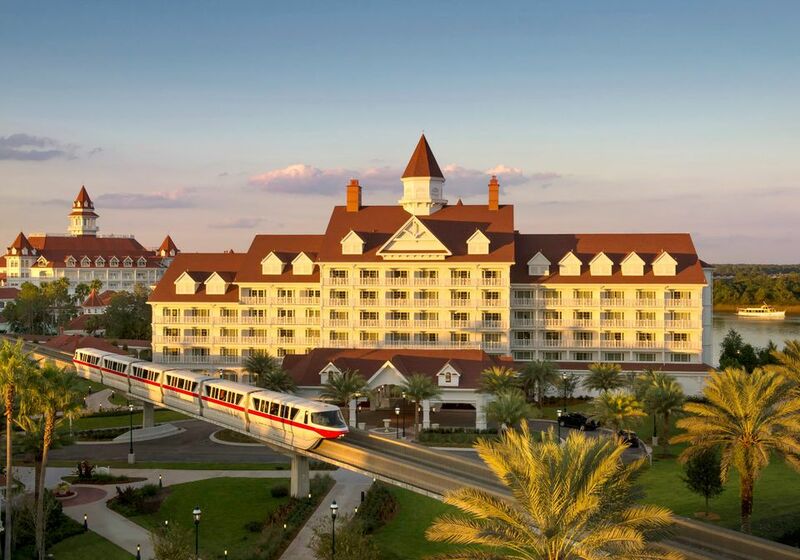 convenient access to/from Magic Kingdom: how smart you'll feel after the MK fireworks, when crowds rush to the Disney transport buses but you simply board the monorail or step onto your shuttle boat to the Grand Floridian. The Grand Floridian has received AAA 4 Diamond and been voted one of the top 50 resorts in the world by Conde Nast Traveler. This is a classy joint, but one where kids are very welcome too. What's special about the Grand Floridian for families? Besides the big plus of being so near Magic Kingdom, the Grand Floridian offers several features on-property for families. this period-style restaurant serves breakfast and dinner buffets. We breakfasted with Mary Poppins characters, and Tigger and Cinderella made appearances too. Character dining is good value at Disney World. Yes, these meals add up to a lot for a family; but we had a sumptuous all-you-can eat buffet breakfast, including Mickey Mouse waffles and strawberry soup, plus lots of fun when characters visit your table, or when Big Bertha -- a 100-year-old band organ-- pipes up with a song. The dinner meal is Cinderella-themed. just for kids 4 to 12, a 1-hour tea party with characters from Alice in Wonderland. Reserve in advance. kids 4-12 can paint their own apron, decorate a chef hat, whip up some treats. little pirates sail to exotic ports of call (at resort marinas) on the Seven Seas Lagoon seeking buried treasure. Pontoon boat, Canopy boat, Sea Raycers, or just charter the yacht. even this prestige property has coin-op washing machines and dryers in all of the buildings. Check section on the Grand Floridian Resort at Walt Disney World. The Allears.Net site has many details. Check Trip Advisor for recent visitor comments.